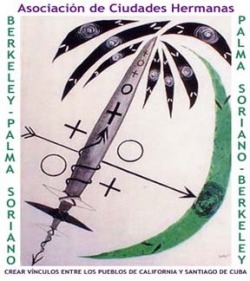 On December 26, 2002, Berkeley, California and Palma Soriano, Santiago de Cuba became official Sister-Cities. Both cities are proud of their history of progressive activism and are concerned with the environment, ecology, spirit, and creativity. Our mission is to nourish this twinning through mutually beneficial exchanges between the individuals, community organizations, and institutions of our two cities. The association will contribute to the efforts on a national and state level to confront the blockade of ideas and strengthen solidarity between the people of the United States and Cuba. We will collaborate with our Cuban sisters and brothers to work on projects of mutual interest in the areas of culture, ecology, science, health, art, education, and human rights.